Do you have a financial plan that recognises changing priorities in later years? Is it flexible enough to meet your future financial expectations? Will it still be risk-appropriate if your circumstances change? 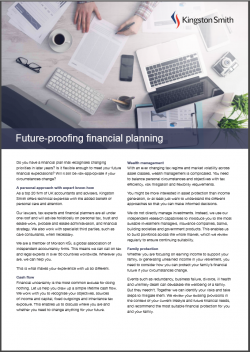 Find out more in our flyer about how Kingston Smith can help you future proof your financial planning.